This serviced office is located on a business park which has great accessibility and plenty of parking. Set in a distinctive modern building, this centre provides comfortable and professional offices to suit your business. This accessible location is ideal for those that value practicality and convenience. This space is accessible 24/7; perfect for companies with international clients. The offices come unbranded and unfurnished to suit businesses of any background. This highly recognisable centre is sure to leave a lasting impression on every visitor. 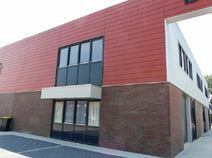 Directly accessible from the highway, this business park is strategically located on the northwest side of Schagen, with excellent accessibility. Ideal for use as a business/showroom, this office space offers a distinctive presence, ideal for businesses that wish to project a lasting, impressive corporate image.